Salt, also referred to as table salt or by its chemical formula NaCl, is an ionic compound made of sodium and chloride ions. All life has evolved to depend on its chemical properties to survive. It has been used by humans for thousands of years, from food preservation to seasoning. Salt's ability to preserve food was a founding contributor to the development of civilization. It helped to eliminate dependence on seasonal availability of food, and made it possible to transport food over large distances. However, salt was often difficult to obtain, so it was a highly valued trade item, and was considered a form of currency by certain peoples. Many salt roads, such as the via Salaria in Italy, had been established by the Bronze age. All through history, availability of salt has been pivotal to civilization. In Britain, the suffix "-wich" in a placename means it was once a source of salt, as in Sandwich and Norwich. The Natron Valley was a key region that supported the Egyptian Empire to its north, because it supplied it with a kind of salt that came to be called by its name, natron. Today, salt is almost universally accessible, relatively cheap, and often iodized. Salt comes from two main sources: sea water and the sodium chloride mineral halite (also known as rock salt). Rock salt occurs in vast beds of sedimentary evaporite minerals that result from the drying up of enclosed lakes, playas, and seas. Salt beds may be up to 350 m thick and underlie broad areas. In the United States and Canada extensive underground beds extend from the Appalachian basin of western New York through parts of Ontario and under much of the Michigan basin. Other deposits are in Texas, Ohio, Kansas, New Mexico, Nova Scotia, and Saskatchewan. In the United Kingdom underground beds are found in Cheshire and around Droitwich. Salzburg, Austria, was named "the city of salt" for its mines. High-quality rock salt was cut in medieval Transylvania, Maragmureş and Southern Poland (Wieliczka). Tuzla in Bosnia and Herzegovina was named in Hungarian Só (salt) from the twelfth century on and later "place of salt" by Turks. Salt is extracted from underground beds either by mining or by solution mining using water to dissolve the salt. In solution mining the salt reaches the surface as brine, from which the water is evaporated leaving salt crystals. The Sečovlje Saltworks on the Northern Adriatic Sea were probably started in Antiquity and were first mentioned in 804 in the document on Placitum of Riziano. Solnitsata, the earliest known town in Europe, was built around a salt production facility. Located in present-day Bulgaria, the town is thought by archaeologists to have accumulated wealth by supplying salt throughout the Balkans. Salt was of high value to the Jews, Greeks, Tamils, Chinese, Hittites and other peoples of antiquity. Aside from being a contributing factor in the development of civilization, salt was also used in the military practice of salting the earth by various peoples, beginning with the Assyrians. In the early years of the Roman Republic, with the growth of the city of Rome, roads were built to make transportation of salt to the capital city easier. An example was the Via Salaria (originally a Sabine trail), leading from Rome to the Adriatic Sea. The Adriatic, having a higher salinity due to its shallow depth, had more productive solar ponds compared with those of the Tyrrhenian Sea, much closer to Rome. The word "salary" comes from the Latin word for salt. The reason for this is unknown; a persistent modern claim that the Roman Legions were sometimes paid in salt is baseless. 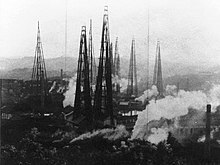 Vertical derricks and drilling rig from Qing dynasty Zigong, China extracting brine from deep underground wells. In the Old Testament, Mosaic law calls for salt to be added to all grain offerings (Lev. 2:13) and compares the priestly covenant between God and the kohen patrilineal descendants of Ahron to salt. Salt is used as a metaphor in the Bible. In the New Testament, Matthew 5:13, Jesus said, "You are the salt of the earth". He added that if the salt loses its flavor, it is good for nothing but to be trampled. In addition, the preservative quality of salt is in view here to show how the disciples were called to preserve the society and the world around them from moral decay. On another occasion, according to the Gospels, Jesus commanded his followers to "...have salt within them." Salt created and destroyed empires. The salt mines of Poland led to a vast kingdom in the 16th century, only to be demolished when Germans brought in sea salt (which most of the world considered superior to rock salt). Venice fought and won a war with Genoa over spices. However, Genoese Christopher Columbus and Giovanni Caboto would later destroy the Mediterranean trade by introducing the New World to the market. In American history, salt has been a major factor in outcomes of wars. In the Revolutionary War, the British used Loyalists to intercept Revolutionaries' salt shipments and interfere with their ability to preserve food. During the War of 1812, salt brine was used to pay soldiers in the field, as the government was too poor to pay them with money. Before Lewis and Clark set out for the Louisiana Territory, President Jefferson in his address to Congress mentioned a mountain of salt, 180 miles long and 45 wide, supposed to lie near the Missouri River, which would have been of inconceivable value, as a reason for their expedition. Wich and wych are names associated (but not exclusively) with brine springs or wells in England. Originally derived from the Latin vicus, meaning "place", by the 11th century use of the 'wich' suffix in placenames was associated with places with a specialised function including that of salt production. Several English places carry the suffix and are historically related to salt, including the four Cheshire 'wiches' of Middlewich, Nantwich, Northwich and Leftwich (a small village south of Northwich), and Droitwich in Worcestershire. Middlewich, Nantwich, Northwich and Droitwich are known as the "Domesday Wiches" due to their mention in the Domesday Book, "an indication of the significance of the salt-working towns in the economy of the region, and indeed of the country". Salt was very important to Europe because it was hard to trade with Africa and they needed to produce it themselves. Monopolies over salt production and trade were essential aspects of government revenue in imperial China and most of the 20th century. During modern times, it became more profitable to sell salted food than pure salt. Thus sources of food to salt went hand in hand with salt making. The British controlled saltworks in the Bahamas as well as North American cod fisheries. The search for oil in the late 19th and early 20th centuries used the technology and methods pioneered by salt miners, even to the degree that they looked for oil where salt domes were located. One of the traditional methods of salt production in more temperate climates is using open pans. In open-pan production, salt brine is heated in large, shallow open pans. The earliest examples of this date back to prehistoric times and the pans were made of either a type of ceramic called briquetage, or lead. Later examples were made from iron. This change coincided with a change from wood to coal for the purpose of heating the brine. Brine would be pumped into the pans and concentrated by the heat of the fire burning underneath. As crystals of salt formed, these would be raked out and more brine added. In the second half of the 19th century, industrial mining and new drilling techniques made the discovery of more and deeper deposits possible, increasing mine salt's share of the market. Although mining salt was generally more expensive than extracting it from brine via solar evaporation of seawater, the introduction of this new source reduced the price of salt due to a reduction of monopolization. Extraction of salt from brine is still heavily used; for example, vacuum salt produced by British Salt in Middlewich has 57% of the UK market  for salt used in cooking. The earliest systematic exposition of the different kinds of salts, its uses, and the methods of its extraction was published in China around 2700 BCE. Hippocrates encouraged his fellow healers to use salt water to heal various ailments by immersing their patients in sea water. The ancient Greeks continued this, and in 1753, English author and physician Dr. Charles Russel published The Uses of Sea Water. ^ Maugh II, Thomas H. (1 November 2012). "Bulgarians find oldest European town, a salt production center". The Los Angeles Times. Retrieved 1 November 2012. ^ Alper Gölbaş (1970-01-01). "Anadolu Kültür Oluşumunda Tuzun Rolü- The Role of Salt in the Formation of the Anatolian Culture | Alper Gölbaş". Academia.edu. Retrieved 2014-05-29. ^ Ridley (1986). "To Be Taken with a Pinch of Salt: The Destruction of Carthage". Classical Philology. 81 (2): 140–146. ^ Bloch, David. "Economics of NaCl: Salt made the world go round". Mr Block Archive. Retrieved 2006-12-19. ^ Bloch, David. "Salt and the evolution of money". Mr Block Archive. Retrieved 2006-12-19. ^ "The history of salt production at Droitwich Spa". BBC. 2010-01-21. Retrieved 2011-03-28. ^ Gainsford, Peter. "Salt and salary: were Roman soldiers paid in salt?". Kiwi Hellenist: Modern Myths about the Ancient World. Retrieved 11 January 2017. ^ "Account of Louisiana". Library of Congress. p. 12. Retrieved 2016-09-10. ^ a b "Domesday Book". Domesday Book. Archived from the original on 2012-02-27. Retrieved 2012-02-13. ^ "Solar Salt production". Salt Institute. Retrieved 2006-12-19. ^ "Towards an understanding of open pan salt making". Lion Salt Works History & Heritage. Archived from the original on 2006-12-22. Retrieved 2006-12-19. ^ "Early Salt Making". Lion Salt Works History & Heritage. Archived from the original on 2006-12-22. Retrieved 2006-12-19. ^ "Vacuum Pan Salt Refining". Salt Institute. Retrieved 2006-12-19. ^ The Competition Commission. "Factors affecting rivalry in the relevant market prior to the merger" (PDF). British Salt Limited and New Cheshire Salt Works Limited: A report on the acquisition by British Salt Limited of New Cheshire Salt Works Limited. Retrieved 2006-09-10.